muscle weakness simvastatin | DR Yiota: The BLOG because pursuing a JOYful life is a journey worth taking! This is a continuation of my story about Simvastatin (part 2). (1) Degenerative disc disease most severe at L5-S1. (2) Mild apparent limb length discrepancy (10 mm). (3) Mild right and moderate left osteoarthritis. Leg length discrepancy? Really? Since WHEN? Dr. Chiropractor said LLD sets in by adolescence and because we are young and strong then, our bodies compensate for the differentiation and we do fine until mid-age but certainly (get this …) by YOUR age people show significant lower back pain. He said this is the reason my adjustments are not sticking; why my back and hip are hurting so much; and the resolution might possibly be quite simple: shoe lifts inserted into the shoes. He said it will take a long time for my body to straighten itself out. Well this sounded reasonable to me, and so I tried the lifts. My hip and back pain significantly decreased, and I noticed that being barefoot for any reason at home brought on tremendous pains which disappointed me because while not a barefoot princess per se, I do luv my flip flops during warm weather months. I knew I had to say good-bye to them. BUT the stabbing pain in my thigh continued, and while on one hand some of this made sense, I was still feeling we are all “missing something”. I still felt wheelchair bound and starting to think my active life as I had once known it to be had taken a turn towards a slow ending of pain and immobility. TBC but first …. read this article I’ve included. “Muscle pain and weakness is actually the most common side effect of statin drugs, and is thought to occur because statins activate the gene atrogin-1 gene, which plays a key role in muscle atrophy. In severe cases, a life-threatening condition called rhabdomyolysis, in which your muscle cells break down, can also develop. However, muscle pain and weakness is often downplayed as a minor side effect of statin drugs, and one that typically goes away within a couple weeks of stopping the drugs. In reality, as this new study points out, if you’re experiencing any muscle pain when taking statin drugs, it could be because structural damage is occurring, and this damage may occur even when tests for a protein thought to signal injury are normal. Further, the damage may persist even after statin use is halted, meaning these drugs may cause permanent muscle damage. Folks, this is in no way a minor side effect or nuisance. Muscle pain and weakness may be an indication that your body tissues are actually breaking down — a condition that can cause kidney damage. One thing is for sure. You should NOT ignore symptoms of pain and muscle weakness if you are taking statin drugs, as they can deteriorate into even more dangerous conditions, including death. Muscle atrophy is defined as a decrease in the mass of the muscle; it can be a partial or complete wasting away of muscle. This is the beginning of my story about Simvastatin (part 1). 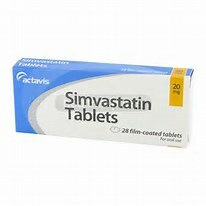 I was prescribed Simvastatin in 2012 because my cholesterol reached a new high of 220 which is a number some would laugh at in regards to “high”. My PCP explained that since I have high blood pressure, Diabetes 2 (both managed), and have a significant family history of these diseases that I am at high risk for a heart attack. At that time, I was a primary-care giver and under a tremendous amount of stress on all levels. During the time I cared for my twin sister who struggled with Alzheimer’s common to Down Syndrome, every time I went to the doc for a check up I returned home with a new diagnosis In addition to being disgusted with my family genetics, I was scared for my own mortality. So I started the drug. I didn’t connect the dots at that time but shortly afterwards, I started to notice lower back and hip pain and soon left leg (thigh) weakness as evidenced by my leg sometimes giving out on me. I wrote these symptoms off in my mind as having injured my back lifting and moving my sister as needed at the time. As time (weeks, months, and years) went on, the pain intensified to the point that nine months ago I frequently could not step on my left foot. The weakness changed to stabbing pains that felt as if a butcher knife had been inserted into the front (anterior) of my thigh, and my leg would buckle so much that I would stumble and lose my step. This began to occur daily and then several times during the day. I found myself leaning on walls to support myself as I tried to walk. I would crawl on all fours to get around. I would use chairs with wheels as a walker-type support to get from place to place. These symptoms grew worse during the night so much so that I would writhe in pain for hours. When I awoke, I had to hold on to anything available before I could gain any sense of mobility. I felt as if I was heading for a wheelchair-bound lifestyle within a few more months. However, at this point in my story I did not know WHY this was happening, and although I had reported this pain to 4 doctors and had 3 MRIs no conclusion was attained. So NOW my DEDICATED quest for answers began … this HAD to be more than having injured my back years ago!